The island of Maui offers innumerable features and beautiful landscapes for visitors to enjoy. One of the more prominent areas in Maui is the historic town of Lahaina. The Hawaiians once called the area “Lele” meaning “restless sun.” Lahaina was once a popular whaling port in the 19th century. Here, ships would pass during the whales’ migratory months. To this day, it remains a prime whale watching spot and is a town full of character and significance. But besides these attractions in this town, there is also the historic banyan tree of Lahaina. Banyan trees grow in many places in Hawaii, but the largest tree is in Lahaina, Maui. Sheriff William Owen Smith planted the historic banyan tree of Lahaina on April 24, 1873. He did this to commemorate the 50th anniversary the missionary establishment on Lahaina. The tree was a gift from missionaries in India. Although it was only 8 feet tall when planted, the banyan now covers a city block. With its wide expanse of leaves, this prominent landmark is hard to miss as you approach Lahaina. 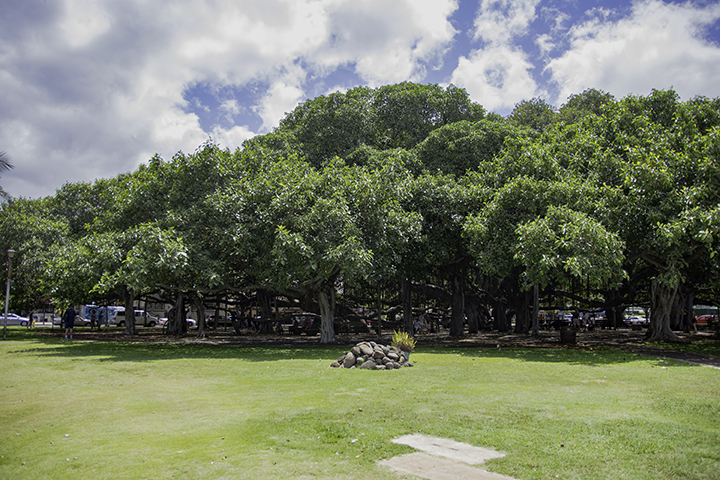 The banyan tree of Lahaina over 15 major trunks and reaches over 60 feet in height. Its dangling vines and labyrinth of branches and dark leaves make this tree quite a spectacle to behold. In the evenings, countless birds sit on its limbs and create an orchestra of squawking and singing. As Lahaina hosts many art exhibits, crafts and events, the banyan offers a natural canopy for such gatherings. One of these events is Art in the Park which occurs every second and fourth weekend of the month. Here, you can view colorful paintings and artistic designs under this flourishing tree. In the town of the “restless sun,” it is nice to relax under the shade of the largest tree of its kind in the United States. The word “banyan” comes from the Gujarati language meaning merchant. The Portuguese used the word for Hindu traders selling their wares under the shade of the tree. Then English writers adopted the word in starting in the 16th century, when “banyan” became the term for the trees themselves. 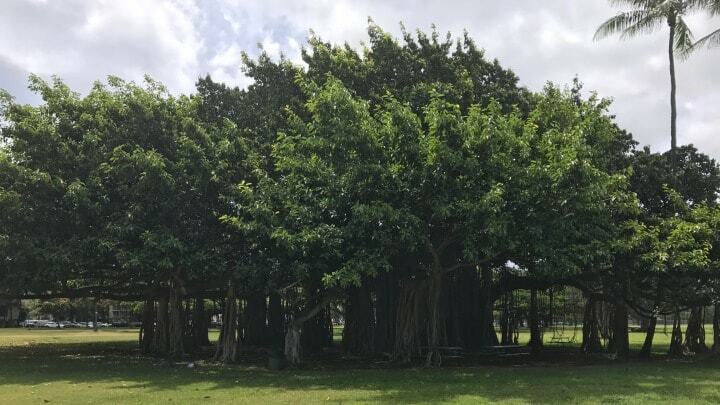 Banyan trees are unique in that they not only grow vertically, but also horizontally. Thin roots grow to the surface of the ground and then can extend forming a new trunk. Here, it can thicken and weave along the original trunk and continue to branch out. A banyan is a kind of fig tree, of which there are many types. Also, birds can disperse the seeds, many of which germinate. When these take root, the tree’s horizontal expansion can continue to occur. These larger-than-life trees are so unique and beautiful that they have been immortalized in legend. Hindus believe the leaf of a banyan tree is the resting place for their god Krishna. According to stories, Buddha received enlightenment under a banyan tree. In the novel, Robinson Crusoe, the shipwrecked main character built a house in a banyan’s extensive branches. Today, people in India and Pakistan consider the tree sacred. You can find other type of the banyan trees across the Hawaiian Islands. Kauai has beautiful Moreton Bay fig trees. On the island of Oahu, you can find many large banyans in public parks, such as Thomas Square. The banyan trees are perfect examples of how flora from other places in the world have flourished in Hawaii.